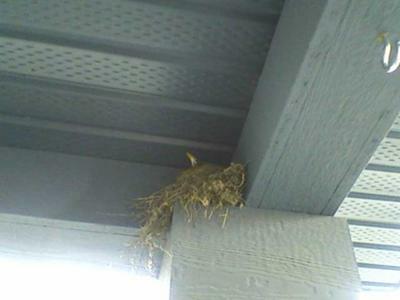 At the first sight of spring (which was a little delayed here in Calgary), my family noticed that we had a visitor busily building her nest up high on the cozy corner of our porch at the front entrance to our home. We were all excited to see her as she went about busily building her nest. She had the nest built so fast we could not believe our eyes and had eggs laid and sitting on them in no time. We enjoy watching our friends and we are careful not to disturb them, yes "them", we notice that the father came around to feed the mother or sit on the nest while she goes to get something to eat. 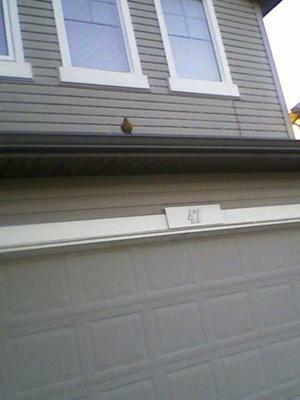 We are careful not to make too much noise coming in/out as to alarm our feathered friends. What a delight it will be when the babies come.